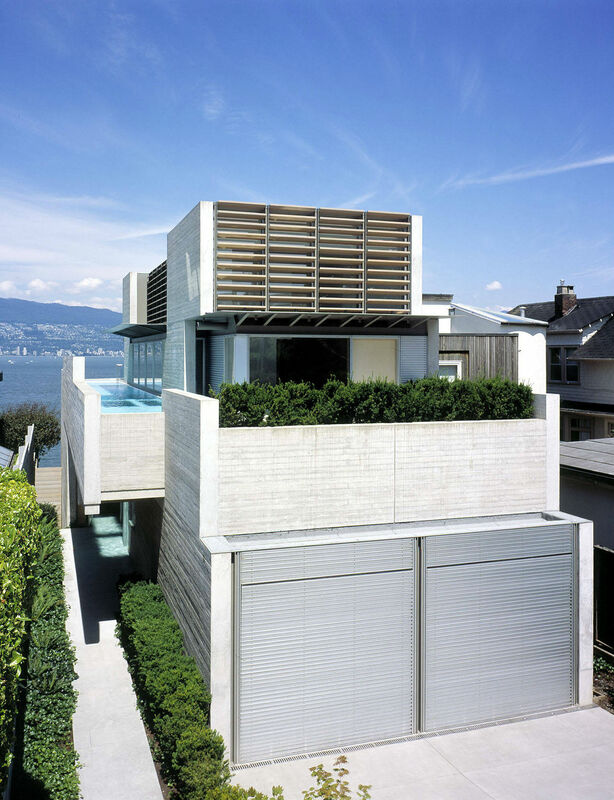 Squeezed into a narrow lot overlooking Vancouver's English Bay, The Shaw House is a great example of architectural design genius! Due to the narrowness of the lot – a mere 8 meters in width – the only possible direction for expansion was to go upwards and out! 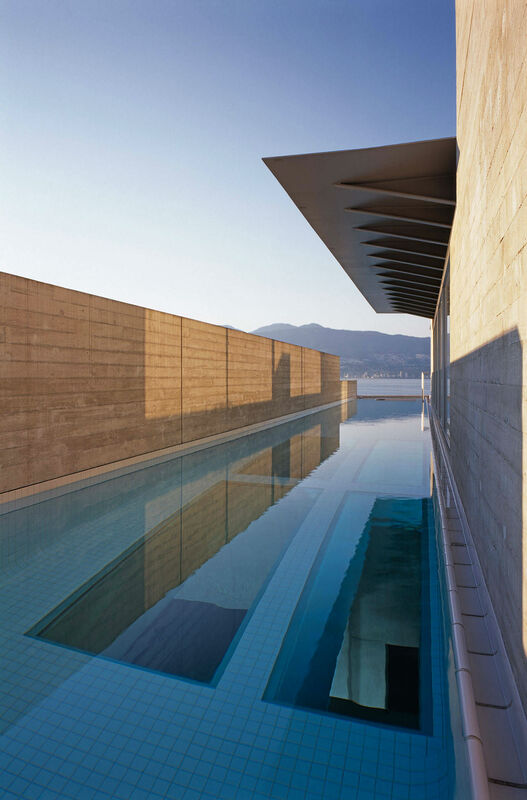 In a masterfully executed response, Patkau Architects stretched out the home length-wise, and included some pretty astonishing design features. 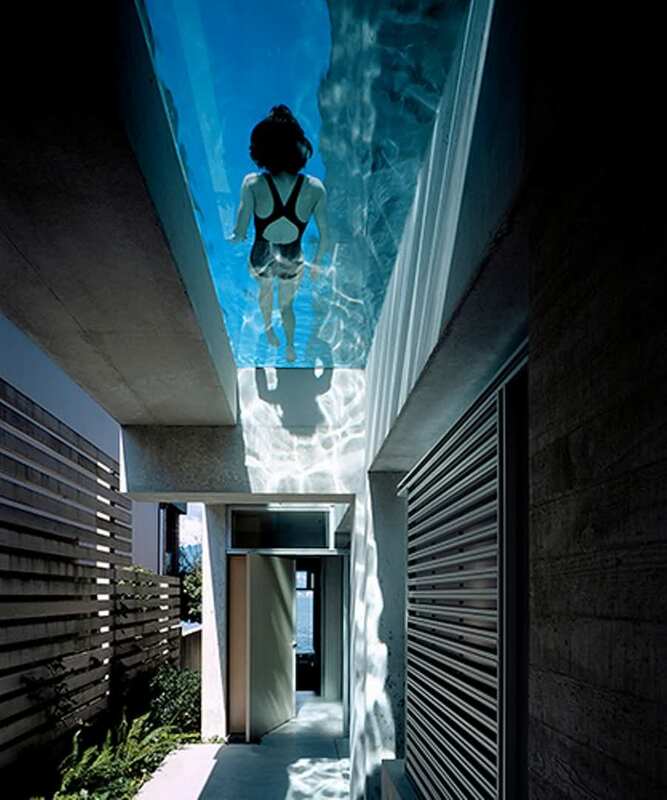 Even as you approach the entrance, without stepping inside, you're greeted by a glass ceiling overhead, which is actually the bottom of the pool directly above. That's right, a pool! Numerous areas of the home are doused in glistening, aquatic light from the water directly above, and from the ocean beyond. 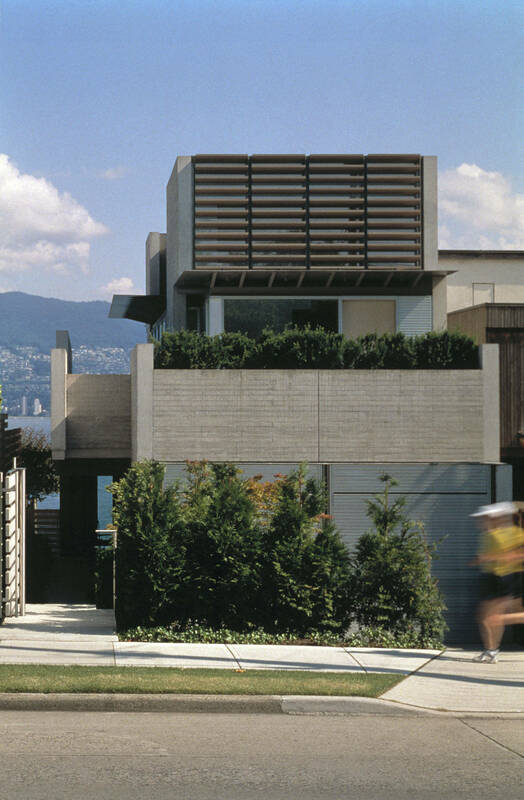 Vancouver is known for being high-risk for seismic activity, so the Shaw House is constructed almost entirely of reinforced concrete. The unique mix of the concrete allows for the structure to remain looking bright when wet, even during the rainy season. 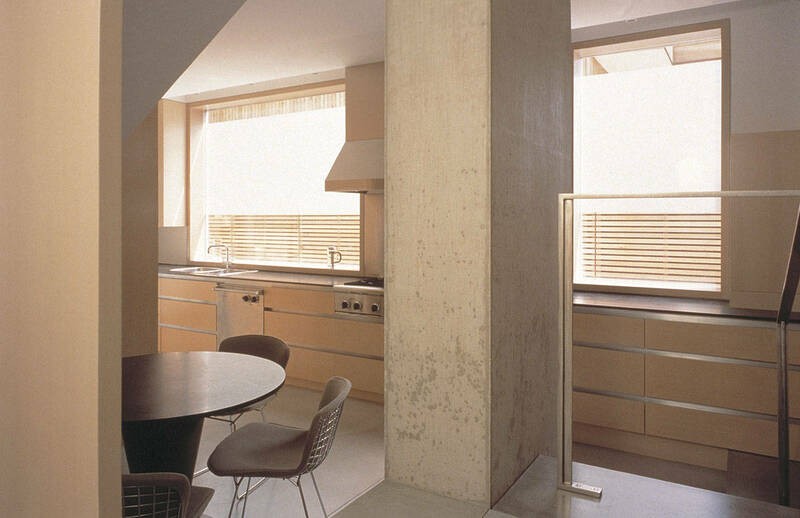 The interior is a contrasting combination of cleanly-painted white walls, and the exposed concrete skeleton of the structure. The light accents of wood add colour, personality and depth. Despite the slim footprint of the dwelling, the thoughtfully-composed interior feels spacious. One reason is the abundant high ceilings with well-placed clerestory windows which drench the space in natural light. The structure contains multiple levels positioned towards the vista, including a stunning outdoor terrace boasting a panoramic view of the ocean and mountains. This compelling property is a testament that Patkau Architects always finds a clever creative solution for complicated sites. 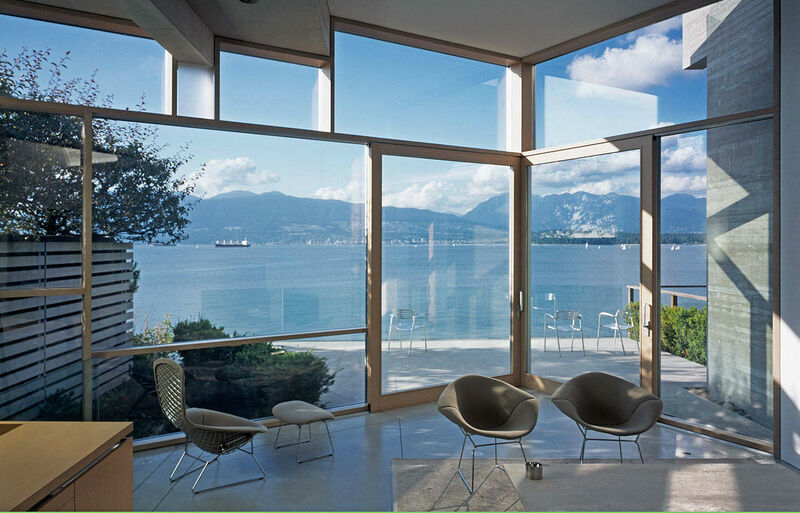 Check out these past Houseporn.ca posts called Linear House On Saltspring Island, B.C. and Whistler’s Hadaway House by Patkau Architects for more amazing examples of their work, or visit Patkau Architects to view their impressive portfolio. All Photographs by Paul Warchol courtesy of Patkau Architects.